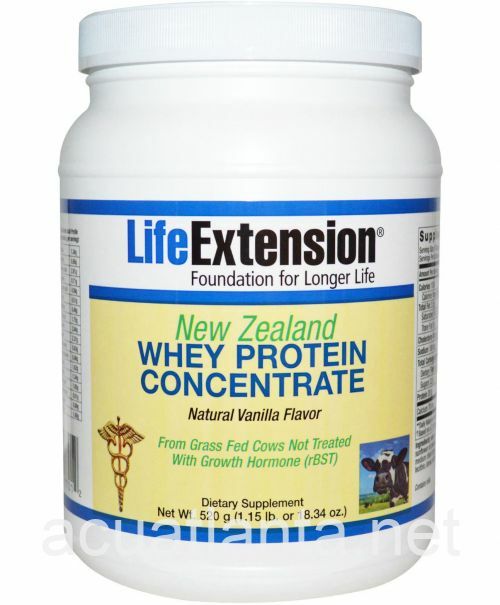 New Zealand Whey Protein Concentrate is a dietary supplement supporting normal immune function. New Zealand Whey Protein Concentrate is recommended for those with muscle deterioration and supporting normal immune system function. Life Extension New Zealand Whey Protein Concentrate contains naturally high levels of essential branched-chain amino acids supporting normal immune function. New Zealand Whey Protein Concentrate is derived from grass-fed, free range cows living in New Zealand and not treated with growth hormone (rBST). New Zealand Whey Protein Concentrate also contains naturally occurring lactoferrin and immunoglobins. As a dietary supplement, mix one (1) scoop in approximately 4 to 8 ounces of water, milk or juice (to taste) daily, or as recommended by a healthcare practitioner. Ingredients: whey protein concentrate, natural chocolate flavor, gum arabic, sunflower oil powder, maltodextrin, modified food starch, medium chain triglycerides, guar gum, sunflower lecithin, stevia extract. Contains milk. New Zealand Whey Protein Concentrate product is available only from licensed healthcare professionals. Buy New Zealand Whey Protein Concentrate Online here at AcuAtlanta.net or our clinic.